The LG G4 was pretty impressive with its leather back and good camera, but still it couldn’t beat the Samsung Galaxy S6 Edge’s cool factor. The LG G5 will certainly have to pull off something special and that’s exactly what’s going to happen according to a source in South Korea. People who have seen the phone have described it as looking like the render above, with a metallic shell and an original way to remove the battery, through the bottom. 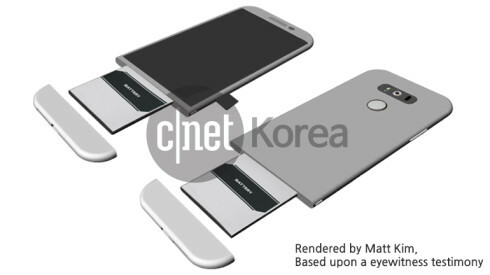 A modular design is quoted and a “drawer method”, that lets the battery slide out of the bottom of the LG G5. The USB port and audio jack will stay at the bottom, which means they can get disconnected from the motherboard when the battery is taken out. This model has been rendered by Matt Kim, based on a eyewitness testimony. The G5 looks very slim and well put together, but we can’t help but wonder where the Power button and volume buttons went from the back. It seems that the back now features a fingerprint scanner and the buttons are back on the sides. Is LG really this desperate to make a mark?